NURBURGRING, Germany -- Toyota Motor Corp. President Akio Toyoda traces today's quality and financial woes to 2003, when the company began an unbridled global expansion, and says winning over new customers in the wake of the crisis will be a challenge. In an interview here Saturday, the publicity-shy grandson of the company's founder also said he wants to scale back the incentives that have spurred U.S. sales this year and revive what he called a “neglected” Scion brand. The Toyota chief added that core models such as the Camry sedan are feeling increased pressure from Ford, GM and Hyundai, which now rival his company in performance and flair. “In 2003, we surpassed the 6 million sales mark, and after that the rate of increase kept growing,” Toyoda told Automotive News on the sidelines of the Nurburgring 24-hour endurance race, where Toyota's Lexus brand was fielding two LFA sports cars. The result: Explosive international growth overstretched its human resources. The company lost touch with customers, its production base ballooned with overcapacity and engineers took their eye off quality. 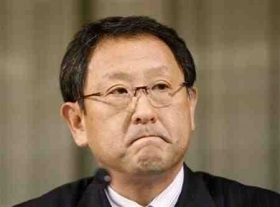 When Toyoda took office, he was saddled with the company's first loss in seven decades, and within months, the company's worst ever quality crisis. Today, the world's largest automaker is back in the black. But it is still besieged by about 300 state and federal U.S. lawsuits, investigations by U.S. regulators and a bruised reputation. Toyoda said his company suffered from multiple communication gaps -- within the company itself and with the public at large. Sometimes, it takes as long as six months for information from Toyota's far flung regional offices to filter up to headquarters in Japan, he said. Toyoda said his company needs to be more transparent. It also fell down in not recognizing its responsibility to fully explain the situation to its customers and the public, he added. Toyota's U.S. sales tumbled at the beginning of the year as the company recalled more than 8.5 million vehicles worldwide, mostly to address problems related to unintended acceleration. But the company bumped sales back up by rolling out the largest incentives in its history. Toyota brand sales shot up 26 percent in April, beating the overall market's 20 percent advance. For the first four months, Toyota's sales had increased 12 percent over the previous year. Toyoda described the March spiff blitz as a necessary evil. The incentives are largely in place through the end of May. But the final decision on whether to extend them will rest with Jim Lentz, president of Toyota Motor Sales, U.S.A., Toyoda said. Long-time Toyota customers are largely unfazed by the recall problem and remain loyal to the brand, Toyoda said. But reaching the uninitiated will be tougher. Just this week, Toyota was toppled as the U.S. champion of customer loyalty in an April survey by Consumer Reports. Both Honda and Ford moved ahead of Toyota in the rankings. “It's true that people who aren't long-term customers or are non-Toyota customers had a slight change (in their attitude toward the brand),” Toyoda said, adding that it was unclear how long it will take to restore the company's image with this segment. A main target of the overhaul will be the Scion brand, which saw sales slump 21 percent through April compared with the same four months of 2009. The brand, due to receive the ultra-compact iQ mini car, needs more zest, he said. He said the Scion concept called for offering a basic car that customers can go wild with personalizing. He likened it to a plain bowl of noodles that people can garnish with toppings of their choice. “Recently, it became more like the regular Toyota vehicles,” Toyoda said. At the same time, Toyota needs to spice up the core models as well.